According to recent studies by the Anti-Defamation League, anti-Semitism is on the rise in Europe, Russia, and the United States. In Arab media, diatribes against Jews are increasingly overt and commonplace, "the elevator music for the Arab world." Much of this anti-Semitic expression is characterised by shrill rhetoric and old prejudices, leaving little room for fresh dialogue on the subject. Uncle Semite seeks to elevate the conversation, moving the rhetorical, knee-jerk anti-Semitism of the past towards a progressive, green "uncle-Semitism," relevant in our time. We hope you enjoy your stay with us at uncle-semite.com. * If this site displays improperly, please install the latest version of Fire Foxman, Sephardi, or your favourite web browser. h n p r once again displayed their Jewish bent, this time in response to a federal report on the rapidly falling rate of circumcision in the United States. - The mention of "intactivists" provoked giggles by both host and guest. - Dr. Diekema dismisses claims made by children's advocates as "largely emotional," when fact-based arguments against genital cutting are typically (and easily) made. * Historically in the U.S., non-circumcised status has intentionally been associated with African-Americans and other minorities in order to cast it as somehow less desirable. Update: Listener response was sufficiently intense to warrant a correction by NPR's ombudsman, who stated that "Listeners did not get both sides of the controversy in this interview." Going further, NPR admitted that their pro-circumcision guest "had a definite opinion" and also corrected his assertions regarding specific language used by intactivists. Sadly, this correction has problems of its own. NPR's explanation that a single interviewee could somehow present both sides of a hotly-debated issue simply because he is a bioethicist makes little sense. Likewise, NPR's two statements that "Diekema actually did an okay job of presenting both sides" and that "he had a definite opinion" are in conflict. In the final page of her "correction," the ombudsman offers two potential remedies, but as far as HNPR is concerned, they've already come out ahead. They did an inaccurate, one-sided story promoting their Jewish agenda, and as redress they are offering: 1) Even more language from their pro-circumcision doctor or 2) A web page which would be seen by a fraction of the number of listeners of the original story. "Charles Freeman, a former U.S. ambassador to Saudi Arabia under attack for his Middle Eastern and Chinese ties, withdrew from consideration as chairman of the National Intelligence Council because of what he called 'distortions' and 'falsehoods' about his record." The Bloomberg article continues: "In a letter to supporters yesterday, Freeman said he withdrew because of a concerted effort by pro-Israel lobbyists to spread 'libelous distortions' about his experience. 'The tactics of the Israel Lobby plumb the depths of dishonor and indecency and include character assassination, selective misquotation, the willful distortion of the record, the fabrication of falsehoods, and an utter disregard for the truth,' Freeman wrote." The JTA has several links to this ongoing story, including this excerpt: "Stephen Walt, co-author of the 'The Israel Lobby,' says in ForeignPolicy.com that critics of the appointment of Charles 'Chas' Freeman are leading a 'McCarthy-like' smear campaign based entirely on Freeman's criticism of Israel: 'The Likudnik wing of the Israel lobby is gradually losing influence, because more and more people understand that its policies are disastrous for both Israel and the United States, and because its repeated efforts to smear people and stifle debate are deeply damaging as well as un-American.'" NB: Walt is an outspoken critic of the Israel Lobby's power and has competently and gracefully withstood the Lobby's numerous attacks. Not knowing much more in the way of details, Uncle Semite would be over His head to comment further. Please feel free to continue your own search of news results for Charles Freeman. David Gregory: "You know Smerc', it's interesting: Jimmy Carter, former president out today saying this is a terrible idea to have her on the ticket. They would reinforce each other's negatives." Michael Smerconish: "Well, respectfully or maybe not so respectfully, I just don't think he's got the clout. I.. I really don't think that Jimmy Carter is swaying uh.. opinion on that issue." Now Michael... Since the question wasn't about 1) your personal opinion of the former president or 2) whether you think the author and elder statesman has any clout or 3) whether Carter was trying to sway public opinion with his remarks, Uncle Semite must enquire: 1) Who the f-ck asked you? and 2) Who the f-ck are you? Carter has been outspoken in his work to bring peace to Palestine and is often critical of Israel on this subject. He has been called every name in the book for his efforts, typically by Jewish Americans. Whenever you hear anyone criticizing Carter regarding Palestine (or indeed any subject), check their ethnicity. Israel's 60th birthday was marred somewhat by the revelation that Prime Minister Ehud Olmert has been accused of taking bribes from a wealthy Jewish-American businessman. "The latest difficulties for Mr Olmert - who is already being investigated in a number of corruption scandals - became public as Israel celebrated the 60th anniversary of its establishment as a state. " While Rachel Maddow sincerely laments the loss of life in Afghanistan and Iraq on each and every show and rightly blasts the neo-cons for the Iraq war, not once has she mentioned Israel's role in this debacle. Sadly, as we have learned from Rachel and her fellow host Thom Hartmann, criticism of Israel is simply not allowed on Air America Radio. 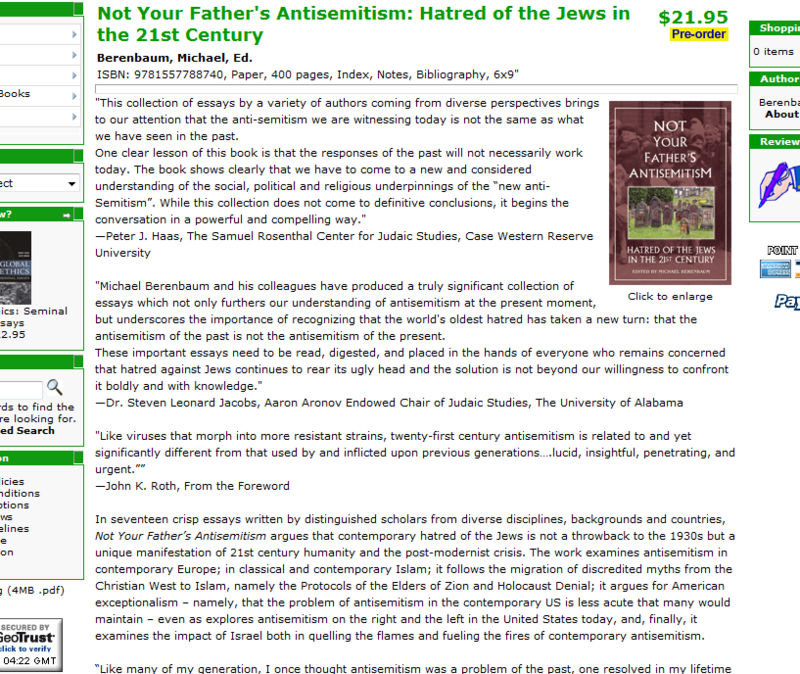 Paragon House Publishers is scheduled to release "Not Your Father's Antisemitism: Hatred of the Jews in the 21st Century" in April 2008. Before you get excited and pre-order the book, please know that the only part authored by Uncle Semite is, presumably, the title. 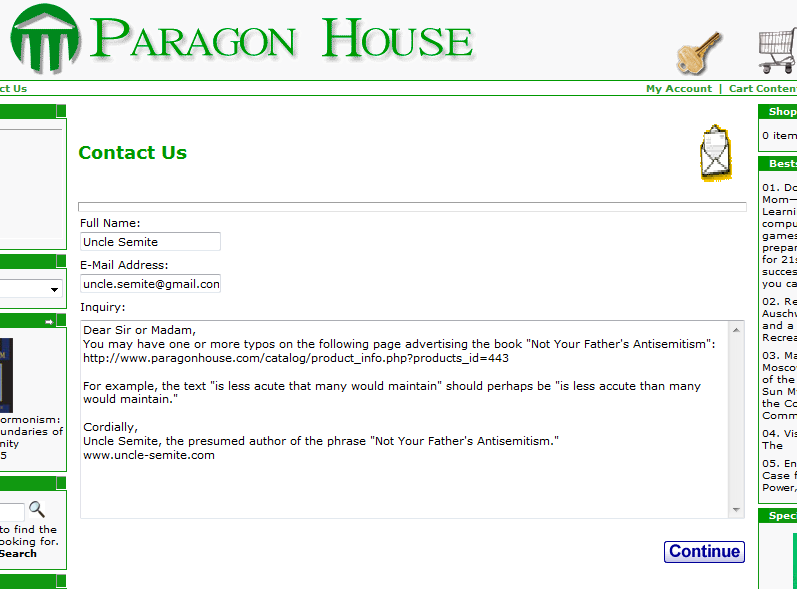 Excerpts and a summary of the book (complete with grammar errors) can be found at Paragon's website. * Uncle-Semite.com is the work of various contributors, collectively referred to as "Uncle Semite."